It's 8:35 a.m. on a Sunday morning, and I'm lost in Norfair. My brother and I had finally saved up enough allowance to pool our resources and buy an NES a few months prior, but it's only now that I've felt compelled to make time to game before the family heads to church. For the first months that we'd owned our NES, all we had for it was Super Mario Bros. -- a fine game to be sure, but after playing it daily at a friend's house after school for a year, hardly exciting anymore. Now, flush with birthday loot, I'd made use of my first available opportunity to buy my first real NES game. And I was insistent on that point: I wanted to buy it myself. A generous aunt even offered to pay for the game I'd selected, but after freeloading off my NES-owning friends for so long and splitting ownership of the console with my brother, I wanted the satisfaction of knowing that this game was completely mine, earned with my own money. The game I selected would end up being all I owned for NES for a few months, because my refusal to accept that offer of charity had wiped out my savings again. But that turned out to be OK, too. By some joyful, fortuitous quirk of fate, I'd picked up Metroid, despite knowing practically nothing about it outside of a few positive impressions from friends and the fact that it had "mini-bosses," which in my mind were short, stocky, cigar-chomping, tommy-gun-wielding guys in fedoras and pinstripe pants. Needless to say the reality was a far cry from whatever I thought Metroid would be, but the allure of that elegant silver box did its trick. The fact of the matter is, I needed those months to crack Metroid. It was a tough nut, discarding the linear approach of Mario and forcing me to find my own way through the labyrinthine corridors of planet Zebes. The vertical shafts seem to go on forever, and there was always a new room just ahead. Yet eventually I'd explored what appeared to be the full extent of the game. Somehow, though, I'd not yet beaten it; I'd never once met one of the infamous mini-bosses, let alone the eponymous metroids. Eventually, I became frustrated with my lack of progress -- my hero Samus was becoming more powerful! I had lots of great weapons and could make paste out of every bad guy I encountered! So why couldn't I advance? So this early Sunday morning sees me messing around aimlessly with nowhere in particular to go. I've loaded up my most recent password, which sets me at the entrance to Norfair with the requisite 30 points of health, and once I top off Samus's energy by blasting a few dozen of the endlessly respawning creatures in nearby rooms, I start simply messing around for the hell of it. Blowing up enemies with missiles to watch them explode into tiny fragments, rolling around instead of running, killing creatures with bombs just because I can. And then, something curious happens. A bomb placed haphazardly at the bottom of a vertical shaft explodes... and takes with it a chunk of the floor. This surprises me, because while I know certain floor and wall tiles are vulnerable to explosions, those had always been set apart with cracks. This section of floor, on the other hand, didn't look any different from the rest of Norfair -- an extrusion of what appeared to be purple bubbles of different diameters. Curious, I let the floor regenerate and bomb it again. And again it boils away beneath my bombs. So, I start rolling around to see what else I can destroy. A few more floor tiles evaporate, but ultimately this leads to nothing. Still, I've made an important discovery. I run to a nearby room and start bombing everywhere: on the floor, in the air, against the walls. And here's where it all pays off, because a bomb placed at head height against a nearby wall as my spherical hero is lifted into the air by explosive force shatters a block. I bounce into it, Samus still tucked into a ball, and roll until I can go no further. Another bomb clears this latest obstruction, and another, and another, and suddenly I've uncovered an entirely new room. I've cracked the mystery of Zebes. Naturally, this is the moment my parents choose to drag me away from the TV and to church. But my accomplishment burns hot in my mind all through the service and sermon, and after lunch I waste no time in getting back to the game. It's on this afternoon that I begin meticulously mapping out the game, one screen per grid of graph paper, pickups and secrets carefully noted. 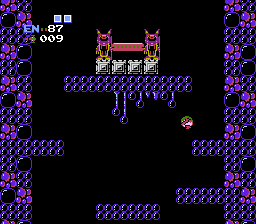 I won't triumph over the Mother Brain and escape from her lair for several weeks yet, but I've learned the secret lesson of Metroid -- search everywhere -- and it becomes the Rosetta Stone for decrypting Zebes's hidden challenges. In the end, when I watch the credits roll, it's because I conquered the game with my own skill and, perhaps more importantly, my own powers of observation and exploration. Metroid was a remarkable game, because when it was first launched -- back in 1986 -- action games were thoroughly simplistic. Certainly Metroid wasn't the first to add a touch of exploration to the mix; David Crane's Pitfall! duology was all about taking a sense of complete freedom and applying sufficient discipline to reach a goal. No doubt there were a handful of obscure, free-roaming, isometric platformers for British PCs by that point, too... though given the insular nature of both Nintendo and UK gaming in the '80s, they might as well have existed on different planets. Besides, what Metroid added to gaming was more than just the ability to wander around; it also brought with it a refined sensibility, a solidity lacking in its predecessors. That's down entirely to the NES hardware -- the first-ever console with sufficient power to pull off a game like this -- and the budding talents of Nintendo's internal development teams. Older systems like the VCS and ColecoVision lacked the speed necessary for the fast, responsive jumping and shooting seen here, and few third-party NES/Famicom games to this point had been of such quality, either. Metroid didn't feel quite as spot-on as Super Mario Bros., but one got the impression that the slightly floaty controls were a deliberate choice, at least in part. Samus's slow jump was difficult for newcomers to manage, but there was purpose behind its nature: It was a tool to be used for exploration, and like all complex tools required a certain degree of mastery. Learning how to make Samus jump properly was an essential key to success in Metroid. A simple jump straight up couldn't be steered like (and didn't reach as high as) an angled jump -- but adding horizontal motion to a leap would cause Samus to spin, making landings tricky. The game's lengthy vertical shafts were a training ground for these skills, practice for the eventual acquisition of the High-Jump Boots. Those in turn allowed Samus to reach even higher places, but they also demanded a delicate touch to use correctly. 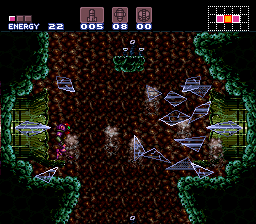 The payoff for this, though, was the Screw Attack, a device that turned Samus herself into a weapon -- but only while executing one of those tricky spinning jumps. An old man in The Legend of Zelda proffered the Master Sword, the game's most powerful weapon, conditionally: "Master using this and you can have it." Heroes without a certain amount of life force were out of luck. Metroid imposed no such limitations on its weapons and tools; if you could find them, the game apparently reasoned that you had what it took to make use of them. The player was thus left to his own devices. Quite literally, in fact. Unlike in Zelda, where weapons and tools were segregated and rarely did the twain meet, Samus's weapons were her tools. Her jumping skills eventually became an incredible destructive force. Her Ice Beam could freeze enemies and, in stark defiance of physics, transform them into floating, immobile, harmless stepping stones for reaching new areas. Her bombs allowed her to destroy enemies beneath her reach as well as burst open new areas for exploration. Even missiles were essential for opening locked doors. Nothing Samus acquired was extraneous, although the player's choice of power-ups could make things trickier -- completing the game with the Wave Beam takes guts, and tackling the Mother Brain's lair with the Wave Beam and no Varia is a challenge that even I never attempted in my months of constant replays. And replay the game I did -- obsessively, almost. Something clicked in my brain that fortuitous Sunday morning, and I became endlessly fascinated with Metroid. The mysterious, ethereal music that played in rooms where ancient bird statues sat silently to offer you a prize. The potential around every corner for a new discovery. The strange and easily destroyed clone of mini-boss Kraid. (Turned out he was a stocky lizard beast, not a gangster.) The intriguing color glitches, and the shared strategies and exploits discussed daily in the school lunchroom; we didn't know back then that these things were simply the result of the game straining to keep up with players doing things that had never been intended. In our minds, Metroid's vast "secret worlds" were, like the Minus World of Super Mario Bros., brilliant Easter eggs hidden by programmers far smarter than ourselves, and at the end of each was surely a phenomenal prize to be claimed. Ultimately, though, all I had to show for my efforts was the revelation that Samus was a girl, and that her battle bikini was somehow just as resistant to acid and magma as her bulky metallic space armor. Oh -- and, of course, I'd developed a taste for freedom and exploration in videogames. It's 1994, early June, and much to my surprise I'm lost in Norfair again. It's an unexpected twist of events on multiple levels. For one thing, it means I'm playing a videogame; a year prior I'd given up gaming as a waste of time. When I headed off for my first year of college, I took along a computer and not my Super NES. The medium had seemingly grown stagnant, I had more important uses for my money, and my first year of college couldn't really afford to be interrupted for a children's pastime. A Christmas break spent playing Secret of Mana almost changed my mind, but ultimately I went back to school empty-handed. So the last thing I ever expected was to find myself totally engrossed in a game just a few months later. Just as unexpected, though, is the nature of where I've become lost. Norfair, the fiery zone full of magma caverns beneath the surface of Metroid's planet Zebes... well, it's a place I know by heart. Even six years after first untangling the mysteries of Metroid, I can work my way through its tangled corridors on pure instinct. It's down to a science, ingrained in my mind through repetition, like riding a bike or walking. To become lost in Norfair? Unthinkable. Ah, but then, this isn't precisely the same Norfair I'd memorized through years of rote force. Or rather, it is, but time and explosions have reshaped it, closing off many familiar passages and opening up entirely new areas. Where the Norfair I knew was a simple series of rocky hallways and shafts arranged in a fairly simple grid, this Norfair is far more intricate and varied. Its rudimentary tubes and tunnels now open into expansive caverns criss-crossed with platforms, mechanized doors, entire hidden rooms, and complex passageways. The same could be said for all of Zebes, now; in rocky Brinstar, the cold stone has melted away to become fungal greenery, the falling petals of some subterranean flora creating a strangely beautiful and relaxing environment. Pools of corrosive acid are mellowed now, nothing more than harmless water. That's because it's not Metroid I'm playing, but rather Super Metroid. What hasn't changed in this upgrade, I'm learning, is that it's just as easy as ever to find yourself lost in the convoluted passageways beneath the surface of planet Zebes. At this point I've been wandering aimlessly for the past half-hour, uncertain of where I need to go next. 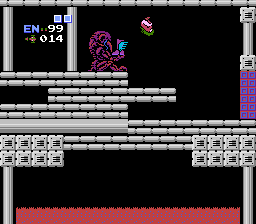 My most recent pick-up is the ever-useful Ice Beam, and as in the original Metroid equipping it allows me to freeze enemies in mid-air, physics be damned. Yet it didn't open up any significant new passages near where I found it, and all I can find here are a lot of dead-ends. I'm just about to switch off the game system and call it a day when a memory begins nagging at me, tugging at my synapses from somewhere in the NES era: a flash of myself freezing the slow-moving Ripper creatures that still patrol the labyrinth and using them as stair steps up a long vertical shaft. I double-back the way I came, back to Brinstar, and sure enough: The shaft that had initially led me to this area is patrolled by a handful of lazily drifting Rippers. I've been ignoring this room, because when I'd first dropped down its length I was unable to climb back and figured I'd need to find another route out. But Ice Beam in hand, what was initially a one-way trip has become my ticket back to the rest of Zebes. As I reach the top of the shaft and resume my journey, I'm gripped by the same sense of satisfaction that forever cemented that long-ago Sunday morning discovery in my memory. I've unlocked the key to this game, again through my own persistence and wit, and once again the secrets of this lonely virtual world are laid bare before me. This sense of empowerment, of discovery and conquest, cuts to the heart of why I love Super Metroid. And clearly, I'm not alone. While I can't speak for everyone else who voted the game to the top spot of this issue, I don't doubt that the appeal of the game for its countless fans - though probably not the same specific memories it evokes for me -- stems from this same uncanny ability to baffle newcomers with its mysteries, then satisfy them once the latest riddle has been solved. For the first time since the Mario brothers relocated from the sewers to the Mushroom Kingdom, Super Metroid gave the "super" prefix a sense of genuine meaning. This third chapter of the Metroid series really was a superior version of the original Metroid, expanded and improved in every conceivable way (with a few nods to the series' well-intended but ultimately underwhelming second chapter.) It was literally twice the game that its predecessor was. Samus had twice as many power-ups -- two kinds of bombs, two kinds of missiles, two suit upgrades, two jump improvements -- and she could shoot in twice as many directions now, thanks to the addition of diagonal aiming. She had twice as many areas to explore, too, with twice as many mini-bosses to battle. 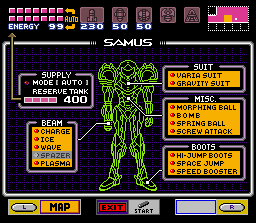 The genius of Super Metroid, though, is that all of these things were integrated together perfectly. Simply bolting new features and abilities onto the structure of a good game is no certain guarantee of easy success; just look at the mess that the latter-day NES Mega Man games became. There the hero acquired new innate powers with each chapter, but with each added skill the unique concept that had made the series so remarkable in the first place was diminished. Not so with Super Metroid; Samus's new capabilities and weapons complemented the rest of her arsenal, expanded her repertoire, and became integral to unlocking the secrets of Zebes. Herein lay Super Metroid's greatest accomplishment. The original Metroid was an essential pioneer in the field of non-linear, exploration-driven, action-game design, yet its world was fairly rudimentary. Likewise the many games that followed in its wake. The NES was loaded with them -- Simon's Quest, Faxanadu, The Goonies II, The Guardian Legend, and many more -- and they appeared on plenty of other systems as well. Wonder Boy got in on the act for Sega, and Ultimate Play the Game (later Rare) entrenched itself in the annals of UK gaming history with the isometric Knight Lore, which in turn inspired countless imitators such as Solstice. And yet, none of these subsequent adventures ever managed to properly improve on Metroid's basic design. Characters could power up as they completed their quest, of course, but for the most part those added abilities simply allowed players to deal more damage or endure more enemy attacks. The keys to unlocking the game worlds were almost invariably precisely that: Keys, tokens that had no real value outside their ability to unlock a door or clear a single obstruction. Simon's Quest made a decent effort by imbuing the Dracula giblets players had to collect with mystical powers, but nothing in the game served a dual purpose. Dracula's rib granted you a shield, but it didn't bypass any obstacles; his heart, on the other hand, was useless for anything besides convincing a boatman to give you a ride. Even more games were like Faxanadu, requiring you to collect a series of useless key items before you could advance. Super Metroid took a different approach, refining the original game's innovative use of Samus's abilities as tools into something far more sophisticated. There was nothing extraneous here: Everything players collected for their intrepid heroine served multiple purposes. Her advanced weapons could destroy foes with ease, but they were also essential for unlocking doors and activating switches. Power Bombs could clear a room of bad guys, but they would also disintegrate obstructions. Super Missiles weren't simply more powerful projectiles, they were essential to opening certain hatches, and their concussive force could dislodge enemies from hard-to-reach places. The Speed Boots let Samus dash, but they also allowed her to turn her entire body into a destructive missile capable of reaching otherwise inaccessible areas. Even the grappling hook -- seemingly useless outside of specific swinging locations -- could double as a sort of kamikaze device, capable of frying a certain powerful foe to a crisp in a matter of seconds, though at high cost to Samus' own well-being. Samus's growth in Super Metroid represents what might well be the pinnacle of player empowerment in games. Games had been offering a sort of give-and-take with the concept of power since Pac-Man gulped his first energizer, and by the time Super Metroid came around RPG and adventure elements had long since crept their way into action games. But generally, this simply meant players spent time finding items that had no real play value: Fetch quests by way of sidescrolling. For Samus, though, progress through the world was simply a natural result of her development as a warrior. As in her first adventure, acquiring a new item gave you access to an area where that item would be essential to survival. Unlike an RPG, there was no need for the contrivance of character levels, because Samus's strength grew in tandem with her ability to explore as a simple matter of course. It was a canny feat of level design, as the game's creators meticulously devised preventative measures that would invisibly but effectively deter players from going out of their depth. Monsters grew more powerful as the adventure proceeded, while hidden passages and other secrets became more devious -- and players were ready for those challenges by the time they appeared, because the previous challenges had groomed them for the task. Yet the game world wasn't divided into discreet levels; even the separate zones were interlinked, all in the name of creating a world that, despite being exquisitely crafted for player progression, felt organic and natural. It didn't feel like a game, but rather a world that the player mastered slowly through discovery and shrewd thinking. Of course, Super Metroid was a game like any other, and in truth it was far less open for exploration than Samus's first adventure. Yet it never felt forced, contrived, or false. There's no greater tribute to the thoughtful precision of Super Metroid's world than the fact that it has long been the single most popular target for gamers who wish to test their mettle with speed runs and sequence-breaking; completing the game armed only with the absolutely essential power-ups is a well-explored gambit these days, and keen-eyed fans continue to seek methods to bypass Nintendo's built-in limitations and play through Zebes out of the intended order. Even now, Super Metroid impresses with its ability to silently guide players, never really breaking the fourth wall (so to speak) outside of a brief message explaining how to activate newly acquired items. But the how and where of those items is always left to the player to determine... with a gentle nudge from the game. You can't leave the dead-end area where the Ice Beam is located until you think to freeze a trio of Rippers as steps to freedom. The only way out of the room where the Space Jump is located is to make a series of consecutive leaps with your newfound ability. And so it goes. Even the game's more advanced techniques are only hinted at obliquely, either with a team of chirpy creatures pantomiming your actions or with an enigmatic glimpse via the attract mode. The original Metroid had done a little of this as well; players trained to run right by Super Mario and its derivatives quickly came to a low passage that forced them to run left until they found the Maru-Mari. Super Metroid, however, turned it into an art. The Metroid experience was defined by its feeling of solitude, and Super Metroid managed to create a far more elaborate, complex, plot-driven adventure without abrogating that sense of cold desolation. The plot and setting built on the groundwork laid down by the first two entries in the series. That's not really a lot to work with, admittedly, but Super Metroid made a worthy go of it. The baby metroid spared genocide out of a sense of maternal mercy at the end of Metroid II serves as the story's catalyst, being captured from a science lab in the game's introduction and propelling Samus's mission indirectly until at last it becomes the eponymous super metroid, an outsize version of its larval form capable of instantly draining the life energy of any creature it touches. 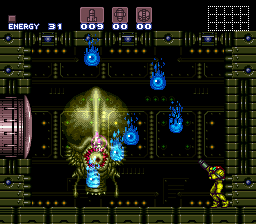 Despite the complete lack of dialogue outside of the pre-game prologue, the narrative surrounding the baby metroid's captivity and fate drive the game from the title screen, which depicts the creature in isolation, surrounded by the bodies of numerous dead scientists in the moments leading up to its abduction. The opening sequence (set on a small, doomed space station) leads directly into the game's primary setting on Zebes, which returns Samus to familiar territory dripping with ominous atmosphere. The idea of revisiting familiar scenes from previous games was hardly anything new by 1994. Zelda II had done it, sort of, by transforming the first game's entire overworld into a tiny pocket of the expanded world map. The Castlevania sequels went a step further: Castlevania III? forced players to battle their way to Dracula's castle, greeting them with a perfect replica of the first game's opening stage (all the way down to its music) midway through the quest to indicate they had reached the keep proper. Actually, Super Metroid's reintroduction to Zebes had more in common with Castlevania II's rendition of its predecessor's locale. Both Castlevania and Metroid had ended with the destruction of the environments the heroes had just conquered, and both sequels presented you with the empty, ominous ruins left behind by the previous episode. Simon Belmont was forced to resurrect and annihilate Dracula here, but when Samus reaches what remains of Mother Brain's platform she's greeted only with silence. There are no enemies to be battled in the remnants of the devastated lair, no music, no hazards -- only searchlights that eerily track her movement. It's not until she descends into Brinstar to collect the Morph Ball in a recreation of the first game's opening moments and returns to the surface that the trap is sprung and the action begins in earnest. While the unsettling sensation of these opening moments is never felt again in the game -- Samus is relentlessly beset by space pirates and native fauna after that initial ambush -- her arrival on Zebes nevertheless sets the tone for the adventure. Super Metroid is about atmosphere as much as it is about acquiring new powers and facing down endless hordes of hostile life forms. The piercing gaze of those searchlights makes it clear from the moment you touch down that you're an intruder in a world that doesn't particularly want you around. And it really does feel like a world; as you explore further into the game, you find more and more areas that break with the orthogonal corridors of the original Metroid and expand outward into vast caverns. Mysteries abound, and the game is filled with trivial details that have little bearing on the core quest. Some of these details are simply for flavor, like the doomed adventurer's corpse being devoured by insects outside Kraid's lair. Others can be exploited for gain, as with the protective turtle-creature that ignores Samus unless she tries to harm its children; the resultant berserk rampage can be used as a means to acquire a hidden item in the ceiling. 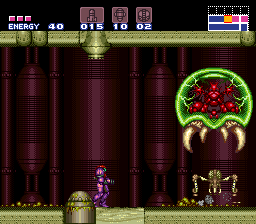 The mournful solemnity of the watery Maridia sector is perhaps Super Metroid's most unique addition to Zebes, an enormous zone that changes dramatically from room to room and contains some of the game's most memorable challenges. It's here that players are given freedom to explore to their heart's content for the first time, and those who search thoroughly and experiment are constantly rewarded. What happens if you let yourself be dragged down into the quicksand? How can you reach that isolated Super Missile? Is it somehow possible to break that fragile-looking glass passageway? Within the scope of the larger quest, each room offers its own distinct puzzles to be solved. And though Maridia may stand out for its refreshing inventiveness, it's hardly Super Metroid's only memorable location. On the contrary, each section -- each chamber within each zone -- is distinct, and distinctive. The enigmatic Wrecked Ship is compact but convoluted, bearing silent testimony to a long-forgotten disaster; initially haunted by energy spectres, the wreckage literally comes to life once the boss is defeated. 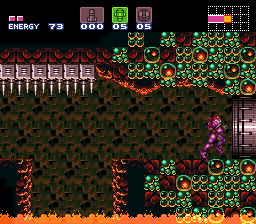 Norfair has been divided into two portions, the second of which is a magma-ridden inferno whose very air is deadly to Samus before her second suit upgrade. And the final zone, Tourian, remains a straightforward series of high-tech hallways, though it too has its share of unexpected surprises. These build up to a stunning twist finale played out in pantomime, yet no less affecting for its silence. The profundity of that dramatic final showdown is difficult to convey in words alone. 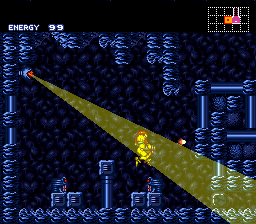 As with so much else about Super Metroid, its power rests in the actual experience. On paper, this game doesn't seem so remarkably different from any of dozens of other 8- and 16-bit platformers, especially now that its style has been mimicked by so many other games. Yet not even the greatest of these imitators (namely, Castlevania: Symphony of the Night, brazen yet brilliant in its lifting of ideas) possesses Super Metroid's streamlined elegance, nor its abundance of new ideas in every room, nor its deft interweaving of narrative and exploration. Here's a game that makes players genuinely care about a speechless bruiser of a woman in chunky armor, and about a deadly alien parasite, and all without a single line of spoken dialogue. Trite as it may sound, there's something genuinely magical about Super Metroid -- something wholly unique that will likely never be duplicated. And even if it is duplicated, so what? Super Metroid was special because it did something new, taking a raw yet promising game and reworking those ideas into something perfect. Nintendo recaptured the spirit of wonder and accomplishment that made the best moments of the original Metroid so engaging, then built a game entirely out of those moments. Nice as it would be to play something that feels exactly like Super Metroid, I've come to realize as I've grown older that a game like that would only ever be a pale imitation of a classic. What I really want, I think, isn't a game that tries to recapture the design of Super Metroid, but rather one that can offer the same sense of amazement and reverence that I felt when I unlocked its secrets that day fifteen years ago. Something that lays down its own rules and explores them to the fullest possible extent. Something so profoundly right that I remember the experience for years to come. Something not exactly like Super Metroid, in other words, but rather as good as Super Metroid. Until then, Nintendo R&D1's Super NES masterpiece will remain the high-water mark for videogaming.